GreenMan Theatre Troupe’s First 10 Minute Play Festival! GreenMan Theatre Troupe is celebrating its fifteenth year as Elmhurst, Illinois’ community theater. From classics ("Macbeth") to musicals ("Urinetown") to dinner theater mysteries ("Cheers to You, Kid!") to out-of-the-box choices ("Monstrous Regiment") to popular plays ("Born Yesterday"), GreenMan’s track record is impressive and consistent. 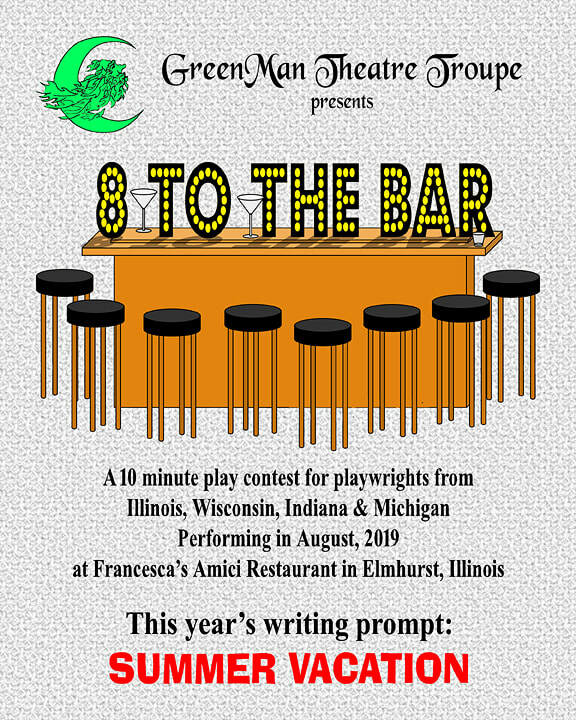 Up to eight directors are needed for this production of eight 10 minute plays. It is community theater; there is no pay. Why should you apply to direct? 1. Community theater directors: this is a chance to have fun, with a minimal time commitment. Also, if you decide to apply for a mainstage show at GreenMan, this will serve to familiarize GreenMan with your abilities, and to familiarize you with GreenMan’s creative atmosphere. 2. Aspiring directors: you’ve been involved in theater in a non-directorial area and now you want to give directing a shot? This would be a good way to dip a toe in the water. You do need to have some background in theater, either in acting or production. But we’re looking to give new directors an opportunity. 1. Directors should send a resume or, if you’re new at this, a short letter of intent, giving some of your theatre background and telling us why you think you’d be a good director. Send these to GreenMan10MP@comcast.net from February 7, 2018 to March 1, 2019. 2. Playwrights were asked to submit up to two 10 minute plays, using the prompt “Summer Vacation.” All entries have been received. The committee will be reading them and selecting up to 16 plays. Finalists will be selected by March 1. 3. Plays and directors will be announced on March 8. Directors will be sent all 16 plays. You will then have two weeks to list your top eight choices to direct, in order of preference. We’ll try to give you your first or second choice, but in the case of a tie, the committee will make the selection and you’ll have something else further down your list. 4. Playwrights who have submitted plays may also submit to direct. But – in the interests of diversity, you will not be selected to direct your own play. 5. Final running order of plays and directors will be announced April 1. 6. Auditions will be held in late June. 7. The show will be performed in early August, 2019 at Francesca’s Amici Restaurant in Elmhurst, Illinois. If you have any questions, please direct them to GreenMan10MP@comcast.net.